Excessive moisture, harsh UV rays, fluctuations in temperature, corrosive salt spray, fog, ice, snow, even wind … it’s a job for the marines! Paradigm’s new marine models, the latest additions to AMS Series v.3, are designed for full exposure to the elements in any environment where excessive moisture is a problem. The “X” designates it an X-treme Moisture Application™ version. What's Different About “X” Models? Protective Conformal Coating on Crossovers acts as an insulation barrier between the military-spec circuit board and the whims of Mother Nature. Let her throw her worst at these speakers, they’ll continue to play without skipping a beat! NEW! Higher-Quality Stainless Steel. Increased corrosion resistance. NEW! 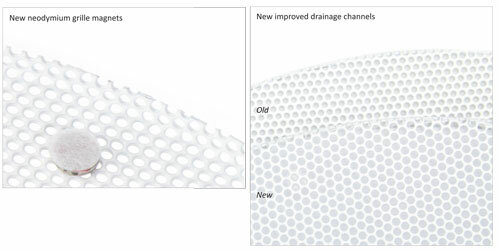 Improved Drainage Channels. Increased product life and improved performance realiability over time. NEW! Neodymium Grille Magnets. Superior adherance during all weather situations vs the original friction-fit grille style. Superior High-Power Mineral-Filled Polypropylene Cones (found on all AMS v.3 speakers) paired with treated rubber surrounds and treated spiders are the ideal choice for harsh weather conditions. Ultra-Violet / Corrosion-Resistant GRIP™ Chassis and Mounting Brackets. Glass-reinforced, injection-molded polymer chassis allow “X” models to bask in the sun all day, while excessive moisture and corrosive salt spray simply rolls off their backs. And as the engine vibrates and the boat rolls over the swells, the Ultra-Rigid™ chassis holds things steady on the music front, preventing unwanted resonances and vibrations from throwing the music off course. Corrosion-Resistant Stainless Steel Grilles and Hardware. Keep these marine speakers in tip top shape. Superior High-Power S-PAL™ Satin-Anodized Pure-Aluminum Domes. Exceptionally rigid, with low mass, these domes ensure extremely uniform and instantaneous power response. Timbral clarity and accuracy is on par with the best freestanding enclosure designs (and far above that usually found in speakers performing in a harsh-weather environment!). High-Power Ferrite / Neodymium Magnets and Advanced Motor Structures. Not only is thermal mass increased due to the higher energy created in the gap, but the intense magnetic field that results allows for overfilling of ferro-fluid. This, in turn, promotes higher power handling — an important consideration in marine applications where speakers must often play at higher volumes to be heard above constant background noise. Paradigm’s Posi-Grip™ Binding Posts prevent connections from becoming loose as a result of vibrations and movement.